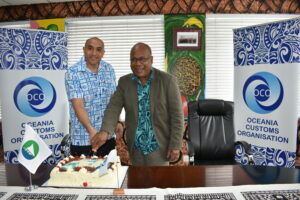 The Oceania Customs Organisation (OCO) Secretariat and the Melanesian Spearhead Group (MSG) Secretariat have signed a MOU to work together in sharing information and technical expertise on areas of mutual interest; trade facilitation, revenue mobilization and border security. 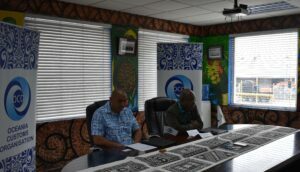 The MOU was signed by the MSG Director General Mr. Amena Yauvoli and Mr. Roy Lagolago, Head of OCO Secretariat at the OCO Conference Room in Suva, Fiji on 13th November, 2018. In signing this MOU, the Director General of MSG Secretariat, Ambassador Amena Yauvoli highlighted the importance of this event. “Through this collaborative partnership, the MSG Secretariat recognizes the important role that OCO plays in delivering its mandate on customs, trade facilitation, revenue mobilization and security. The functions of OCO Secretariat also complement and support the MSG Secretariat’s core mandate to achieve the MSG Leaders vision of regional integration in the MSG sub-region, in particular, the effective implementation of the MSG Free Trade Agreement (MFTA). This partnership enables both Secretariats to work closely together, maximize efficiency and to eliminate duplication in delivering services to our mutual members. The strengthening of the MSG sub-regional initiatives will contribute to enhanced regionalism in the Pacific”. 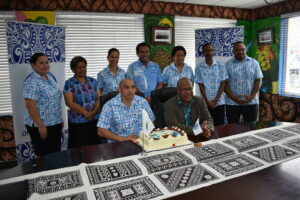 The OCO Head of Secretariat, Mr. Lagolago in his statement indicated that the MSG customs administration aside from Australia and New Zealand are the largest in the OCO membership representing over 60 percent of Customs Officers in the Pacific Island countries. Furthermore, all of the MSG members are using Harmonised System 2017, ASYCUDA World as the common customs automated system, members of the World Trade Organisation and three are parties to the Revised Kyoto Convention. Given the developments within the MSG members, strengthening of cooperation amongst members to implement trade facilitation measures can help drive regional integration. Furthermore, the effective implementation for the bigger administration can provide a platform for assistance to the small customs administration in the OCO region. Mr. Lagolago further added that this new partnership is expected to promote South-South cooperation between member states of both organisations enabling the exchange of idea, experiences and best practices to strengthen customs reforms and modernization in the Pacific. The MOU outlines key joint activities that can be pursued by the two Organisations including consultation and communication on work programmes and implementation of areas of mutual interest, joint training activities, participation of meetings at the respective technical meetings and governing body meetings. By uniting resources and expertise, the MOU will enable both organizations to mutually support each other with the capacity building for the development needs and priorities of their mutual Members.